The Aroma Therapipe2 is the NEW, more affordable and portable version of the Original Aroma Therapipe. The Therapipe2TM offers the same benefits as the Original Aroma Therapipe in a smaller, portable pipe. 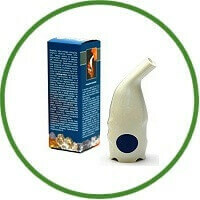 The Aroma Therapipe2TM is based on Speleo/Halo Therapy (cave and salt therapy). Only the ORIGINAL Therapipe and the Therapipe2 crystal salt are from ancient EUROPEAN SALT MINES that are visited by thousands of respiratory patents each year. If you want an alternative to drugs for your respiratory problems, the Aroma Therapipe2TM is for you. Aroma Therapipe2 brings the benefits of salt mine therapy in a portable device you can use anywhere. Children can also use it because of its durable container. It is recommended that each Aroma Therapipe2 be used by only one person. Simple to Use: Place the Aroma Therapipe2TM in your mouth and inhale normally and exhale through your nose. You may experience a slight after taste of salt the first couple of times, but this should dissipate as you continue usage. When the cleansing process starts, it is normal for some coughing and sneezing to occur. It is recommended that you use the Aroma Therapipe2 for 20 minutes a day for 3 weeks. It does not need to be in one sitting, two 10 minute sessions are fine. The Aroma Therapipe2 is effective for at least 6 months of daily use without a refill. The Aroma Therapipe2TM has been registered by the National Product Association. It’s your health, buy the best!